Create a wonderful religious keepsake for your little boy or girl using this beautiful engraved Personalized Any Name Cross with Ribbon. We will skillfully engrave this cross with your choice of any name. 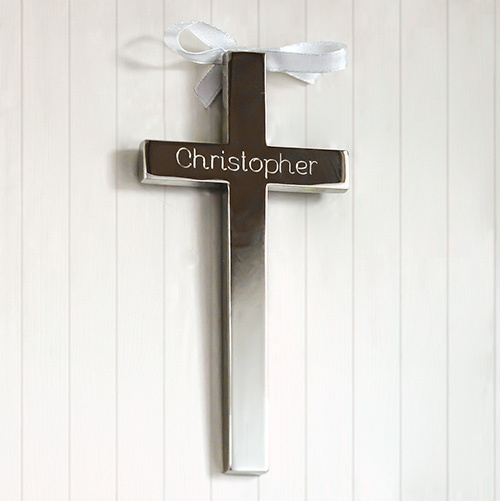 This Engraved Wall Cross provides a lasting remembrance of any special event in your child's life, whether it is for their Christening, Baptism, Communion or any wonderful religious event. Shop our selection of personalized baptism gifts and christening keepsakes today. Presented in a beautiful satin-lined gift box. Laquered and silver-plated, non-tarnish cross comes ready to hang with a white ribbon. Additional Details Check out other Personalized Christian Gifts for all of your religious occasions!